THE SERIAL KILLER ISN'T ON TRIAL. Murder wasn't the hard part. It was just the start of the game. Joshua Kane has been preparing for this moment his whole life. He's done it before. But this is the big one. But there's someone on his tail. Someone who suspects that the killer isn't the man on trial. Kane knows time is running out - he just needs to get to the conviction without being discovered. Perfect from the very first word: The Title! An absolute brilliant read! A plot out of this world and out of the mind of a crazy being. I take my hat off to a brilliant writer! I suffer from a cognitive illness that makes my love of reading a struggle; not so with Thirteen. A great thriller, engaging the reader and leaving ''breadcrumbs" of information that you dont realise you have collected until the very end. Incredibly gripping and the beginning of my enjoyment of Eddie's adventures. A first rate read and highly recommended. If suspence and thrillers serial killers and court dramas with great characters you feel connected to then this book should be your next read!! really enjoyable my first read of this author glad to see he has other novels they are my next read. Super thriller. Really a must read of the Eddy Flynn stories. Read them all. 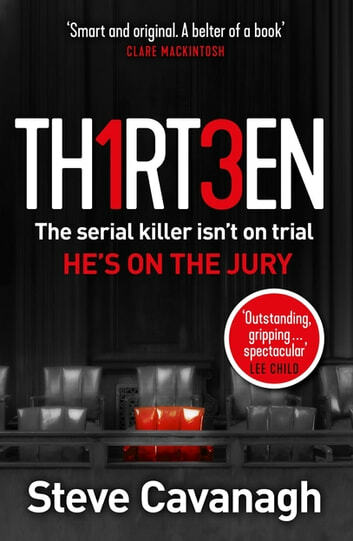 The plea, the defence, The Liar and Thirteen. They are all unputdownable!!!! Can't wait for Steve's next thriller.